This week is Rabbit Awareness Week. This year, the focus is on making sure rabbits get the right nutrition, and in particular how important it is to include high quality hay and grass into a rabbit’s diet. Rabbits should eat their bodyweight in grass each day, and this should make up about 85 – 90% of their diet. Hay should be of high quality and not bedding hay. The best way to tell if hay is of high quality is to smell it; if it smells nice, it’s of high quality. The rest of a rabbit’s diet should be topped up with pellets and leafy greens rather than ‘muesli’ style food. They shouldn’t eat any lawn cuttings, and carrots should be reserved as treats as they are quite sugary. 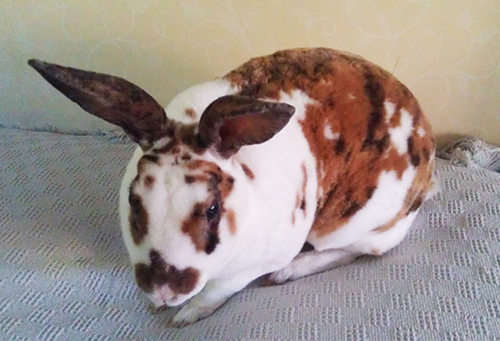 According to vets, inappropriate diet is the number one issue that needs addressing in rabbits. Many rabbits are not fed enough hay. According to Richard Saunders, Veterinary Advisor to the Rabbit Welfare and Association Fund, the benefits of hay are ‘incredible’ and a diet of good quality hay helps combat some of the biggest welfare problems among rabbits, including gastrointestinal disease, obesity and fly strike. For the week of the 10th to the 14th of July, to promote Rabbit Awareness week, we would like to offer free health checks with a nurse, or vaccinations (we now offer the new strain VHD vaccination) or microchipping with a vet. We are also happy to discuss neutering pro's and con's and to answer any questions you may have regarding your rabbits health and wellbeing. We would like to introduce and welcome Sally Allen who joined the practice a few months ago after moving from Pembrokeshire where she worked for 16 years at Tenby vets. Sally, who is married with two daughters, has joined our Ludlow team. 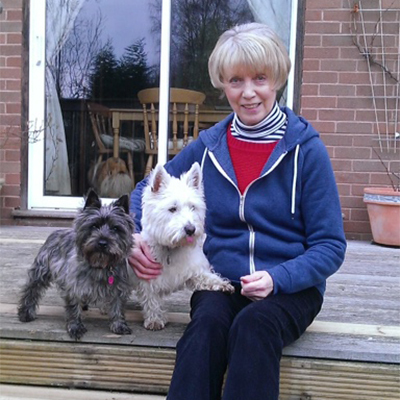 Sally's interests include riding and gardening and she is kept busy looking after her sheep, dogs, cats, chickens and horses. Over the last 50 years hedgehog numbers have sadly declined by 90per cent. 1. Encourage your friends, neighbours and colleagues to drive carefully after dusk, not only on main roads but also around housing estate roads. 2. Check your garden before using a strimmer; hedgehogs love to hide in those long, grassy and brambly parts of your garden. 3. Swap your normal slug pellets for a safer alternative. Even so called ‘pet-friendly’ pellets are not really that friendly - they can be bad news both for the hedgehog and the song thrush. Instead, you could try sheep’s wool pellets, which are a great way to keep slugs and other pests away from your favourite plants and flowers, whilst making sure hedgehogs aren’t harmed. One hedgehog friend buys sheep’s wool from The Sheep Shed shop in School Lane in Leominster - a large bag costs about 50pence. A bag of sheep’s wool pellets is also commercially available from shops such as The Range in Hereford. 4. If you have a garden pond please ensure a hedgehog can get out easily. Hedgehogs can swim but they need a little help along the way! 5. Check cattle grids - they should have a hedgehog exit ramp. On Thursday 23rd March the founder of the British Hedgehog Preservation Society, Major Adrian Coles M.B.E, sadly passed away. You can help to continue the great progress of Major Coles and build upon his work to protect hedgehogs in the UK. At Marches Vets we have a great team of Hedgehog carers who will be happy to help if you find a sick or injured Hedgehog. We will also give advice if you see a hedgehog out in the daytime - not a good sign. We can also put you in touch with one of our home carers for hedgehogs. 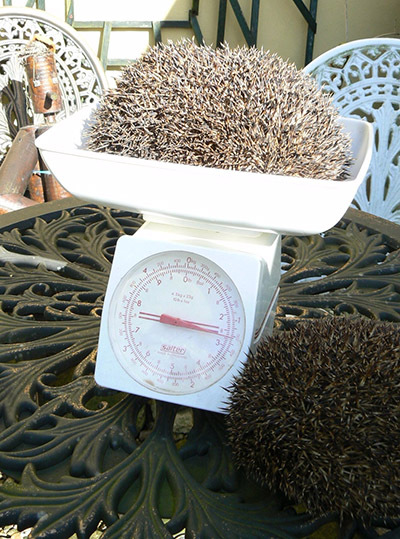 This lucky hedgehog was an autumn hog let and too underweight to hibernate successfully. He's made a great recovery, tipping the scales at nearly 3lbs, and is now being returned to the wild! Wendy has worked as our receptionist in Ludlow for the past 11 years and sadly for us she has decided to retire. 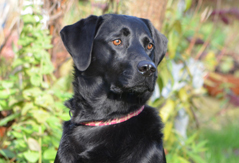 We don't blame her as she has lots to keep her busy.. she loves to train and compete her 2 dogs Skye and Storm and also is very much looking forward to travelling around Scotland and Ireland with Hugh and the dogs in their camper van! Wendy has been part of the Ludlow team for a long time and those of us who work there regularly will miss her (and her cakes!) but we wish her all the best with her plans and hope that she keeps in touch! Next week we are lucky to have Sharon returning to work. Sharon has worked as a Veterinary Nurse in the practice for 22 years and has been on maternity leave after the birth of her second little girl, Phoebe Amelia Phillips on the 20/05/16. 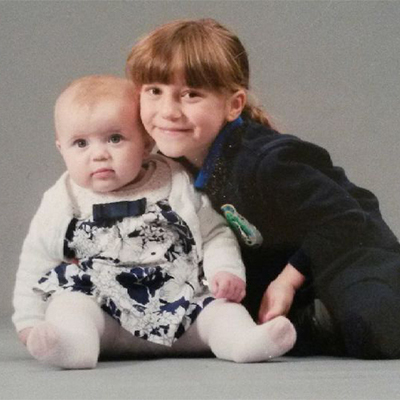 We have all missed Sharon's smiley, happy, ever helpful self and will all look forward to having her back on the nursing team.The photo is of Phoebe and her big sister Isabel who is 6 years old. Avian Influenza (Bird Flu) mainly affects birds such as chickens, geese and ducks but can also affect humans and other mammals. A severe strain of the disease, H5N8, has recently been found in wild and captive birds in the UK. If you keep poultry you should keep a close watch on them for signs of the disease and maintain high levels of biosecurity at all times. Bird Flu can be passed from wild birds to poultry so if you have any concerns about the health of your poultry please phone us for advice. Defra has also produced an advice sheet which can be downloaded here. Pet Plan Veterinary Awards 2017! We would like to say a big thank you to everyone who has nominated us for the Pet Plan Veterinary Awards 2017! 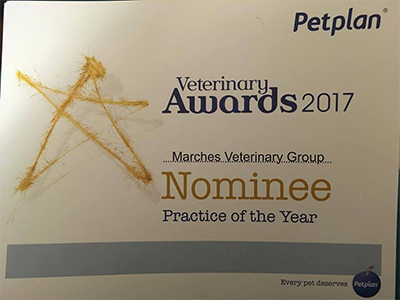 Stuart and Johno have been nominated for Vet of the Year and Marches Veterinary Group has been nominated for Practice of the Year! They recognise that keeping customers happy and pets healthy is a team effort from the receptionist and support staff right through to the vets and nurses themselves. 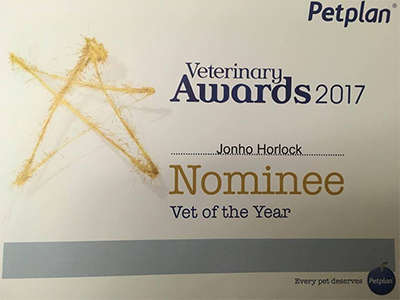 These awards provide an opportunity for pet owners to recognise the hard work and dedication of veterinary staff and say 'thank you'. 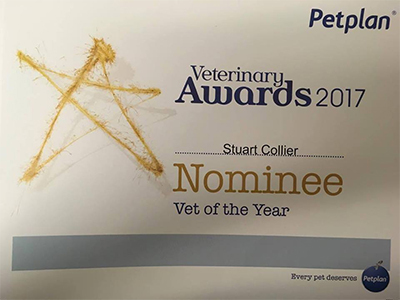 Nominations are judged by an independent panel of leading professionals from the veterinary industry including presidents of the veterinary and nursing associations and previous winners of these awards. These judges have first-hand experience of life in practice and are able to use their veterinary expertise to judge who the truly outstanding teams and individuals are from the thousands of nominations received each year. Petplan are not part of the judging panel. Three finalists will be selected in each category in early March 2017 so watch this space! This section of the site is to provide information about our current activities, events, promotions and news items. Client talks on clinical subjects by our own vets and visiting speakers, often in partnership with the local branch of the British Horse Society. These talks aim to be informative and an enjoyable social occasion and we welcome anyone interested in horses, regardless of whether they are clients of our Practice. We are proud sponsors of Rosie Thomas, local Three Day Event rider and Chief Instructor of the Ludlow Pony Club. Marches Vets also support several local shows and provide veterinary cover at many local events. From 6 April 2016 all dogs in England have to be microchipped and registered on an authorised microchip database by the age of 8 weeks and before transfer to a new owner? 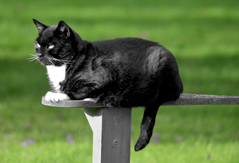 Owners are also required to keep their contact details up to date on the microchip database. Microchipping is a simple procedure that identifies your pet with a unique, traceable form of identity. The microchip is about the same size as a small grain of rice and is injected under the skin between the shoulder blades. Each chip has a unique number that can be read by using a special scanner. This number is held on a national database together with your contact details, providing peace of mind that when your pet is found and handed into a police station, vets or dog warden, he/she can be scanned and easily traced back to you. We encourage microchipping of puppies and kittens with their primary vaccination course. Please visit www.identichip.co.uk for further information. 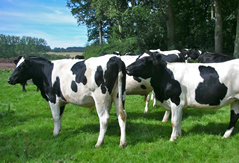 At this time of year the ACTH test which is used to detect Cushing’s Disease (PPID) is at its most sensitive. This means that this autumn period is the best time to test suspicious and previously borderline cases. If your horse or pony has been tested for Cushing’s previously and the result was inconclusive, then they still quality for free ACTH laboratory fees* until the end of October through the Talk About Laminitis scheme. *only for horses and ponies not currently on treatment for PPID. Speak to your vet about testing and download your voucher code from www.talkaboutlaminitis.co.uk before 31st October. As part of our involvement in Horse Health Week we are offering our clients a FREE horse health check*. To download your FREE voucher visit www.healthyhorses.co.uk/horse-week and enter the code 8744P when prompted. *Terms and Conditions-The voucher must be redeemed at the time of vaccination and is valid from 1st October 2015- 31st December 2015. Did you know that from the 6th of April 2016,every owner in England will have to have their dog microchipped by law and registered to an approved database. It is also vital that if your pet is already chipped you keep your details up to date with the chipping company. We have had a few stray dogs brought in over the past few weeks that were happily reunited with their owners thanks to their microchip! We are offering microchipping for only £15.00 so give us a call or pop into the surgery and get your pet chipped. The Animal Health Trust (AHT) and Royal Veterinary College (RVC) are collaborating on a four-year web-based research project – funded by World Horse Welfare – and need 3,000 horse owners to take part. This is an exciting chance for equine owners in Britain to actively participate in scientific research and help to improve the health and welfare of British horses and ponies. Any horse or pony, regardless of whether or not they have a history of laminitis can be registered and a detailed online questionnaire completed providing general information about their horse or pony, their management and previous and current health. •Feel good about helping researchers better understand the triggers of this debilitating disease. Firefighters from Leintwardine, Bromyard, and Malvern and a Vet from Marches were summoned to Wigmore, near Ludlow to rescue black Labrador Deegan after he fell down an overgrown well more than 65 feet deep. After an unsuccessful attempt by his owner to reach the bottom of the well with a ladder, the Fire Brigade was called. Initially, two crews arrived - the retained fire crew from Leintwardine and the Large Animal Rescue team from Bromyard, but they were unable to reach the bottom of the well with the equipment they had with them. The specialist Rescue Team from Malvern was then called and one of the Firefighters managed to secure Deegan in a specialist harness before they were both hauled to the surface and safety. Despite his ordeal, he managed to walk down the hill unaided from the site of his subterranean plunge and, when examined by one of our vets from the Marches, was found to have sustained no more than a few minor cuts. After posing for a photo with the Malvern Fire and Rescue Team and his grateful owner, a wet and cold Labrador trotted off home for a very well earned early supper and extended fireside snooze.